Born, Georg Agricola, German scientist, known as "the father of mineralogy"
Joseph Stefan (24 March 1835 - 7 January 1893) was a Slovenian physicist, mathematician and poet. He published nearly 80 scientific articles, mostly in the Bulletins of the Vienna Academy of Sciences. He is best known for originating a physical power law in 1879 stating that the total radiation from a black body is proportional to the fourth power of its thermodynamic temperature, but his studies included a wide range of other subjects in physics such as diffusion, heat conduction and electromagnetic radiation. K. T. Robert Luther discovered asteroid #58 Concordia, named for the Roman goddess of harmony. Wilhelm Heinrich Walter Baade (24 March 1893 - 25 June 1960) was a German astronomer who emigrated to the USA in 1931. Along with Fritz Zwicky, he proposed that supernovae could create neutron stars. He took advantage of wartime blackout conditions during World War II, which reduced light pollution at Mount Wilson Observatory, to resolve stars in the center of the Andromeda galaxy for the first time, which led him to define distinct "populations" for stars (Population I and Population II). He discovered that there are two types of Cepheid variable stars, and identified the Crab Nebula as the remnant of the supernova of the year 1054, and identified the optical counterparts of various radio sources. He discovered 10 asteroids, including notably 944 Hidalgo (long orbital period) and the Apollo-class asteroid 1566 Icarus (whose perihelion is closer than that of Mercury) and the Amor asteroid 1036 Ganymed. He won the Gold Medal of the Royal Astronomical Society in 1954. He also won the Bruce Medal in 1955, and the Henry Norris Russell Lectureship of the American Astronomical Society in 1958. G. Bigourdan discovered asteroid #390 Alma. C. O. Lampland discovered asteroid #1604 Tombaugh. K. Reinmuth discovered asteroid #1311 Knopfia. C. Jackson discovered asteroid #1318 Nerina. G. Neujmin discovered asteroid #1783 Albitskij. RAF Sgt Nickolas Alkemade survived a jump from his Lancaster bomber when he fell 18,000 feet (5,500 m) without a parachute and lived. NASA launched MR-BD, the the last unmanned Mercury Redstone flight, to test corrections made after previous flights. Compare this launch environment with, e.g., Shuttle launches - for example, note the truck in the foreground. 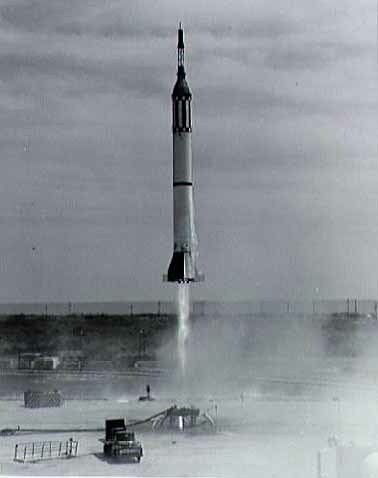 The Mercury Redstone Booster Development (MR-BD) flight, launched 24 March 1961, was the last unmanned Mercury Redstone. The purpose of the flight test was to provide a final check of the launch/vehicle system prior to the manned suborbital flights. The objective was to investigate corrections to booster problems resulting during the MR-2 flight. These problems included: (1) structural feedback to the control system producing vane "chatter"; (2) instrument compartment vibration; and, (3) thrust control malfunction. The launch vehicle achieved a maximum velocity of about 8,200 km/hour and an altitude of 180 km. The capsule travelled nearly 500 km down range for a flight that lasted 8 minutes and 23 seconds. All test objectives of the flight were met. As a result, the launch vehicle was approved for the planned manned suborbital flights. NASA's Ranger 9 impacted the Moon after transmitting 5,814 pictures with good contrast of the Lunar surface during its last nineteen minutes of flight. The probe was equipped to support live display of the photos on domestic television. Ranger 9 was designed to achieve a Lunar impact trajectory and to transmit high resolution photographs of the Lunar surface during the final minutes of flight up to impact. The spacecraft carried six television vidicon cameras, 2 wide angle (channel F, cameras A and B) and 4 narrow angle (channel P) to accomplish these objectives. The cameras were arranged in two separate chains, or channels, each self-contained with separate power supplies, timers, and transmitters so as to afford the greatest reliability and probability of obtaining high quality video pictures. No other experiments were carried on the spacecraft. Ranger 9, launched 21 March 1965, reached the Moon on 24 March 1965. At 13:31 UT a terminal maneuver was executed to orient the spacecraft so the cameras were more in line with the flight direction to improve the picture resolution. Twenty minutes before impact, the one-minute camera system warm-up began. The first image was taken at 13:49:41 at an altitude of 2363 km. Transmission of 5,814 good contrast photographs was made during the final 19 minutes of flight. The final image taken before impact has a resolution of 0.3 meters. After 64.5 hours of flight, impact occurred at 14:08:19.994 UT at approximately 12.83 S latitude, 357.63 E longitude in the crater Alphonsus. Impact velocity was 2.67 km/s. The spacecraft performance was excellent. Real time television coverage with live network broadcasts of many of the F-channel images (primarily camera B but also some camera A pictures) were provided for this flight. NASA terminated contact with its Mariner 10 probe after a Venus flyby and three Mercury encounters. Mariner 10 was the seventh successful launch in the Mariner series, the first spacecraft to use the gravitational pull of one planet (Venus) to reach another (Mercury), and the first spacecraft mission to visit two planets. Mariner 10 was the first spacecraft to visit Mercury. The spacecraft flew by Mercury three times in a retrograde heliocentric orbit and returned images and data on the planet. Mariner 10 returned the first-ever close-up images of Venus and Mercury. The primary scientific objectives of the mission were to measure Mercury's environment, atmosphere, surface, and body characteristics and to make similar investigations of Venus. Secondary objectives were to perform experiments in the interplanetary medium and to obtain experience with a dual-planet gravity-assist mission. Mariner 10 was launched 3 November 1973 on a mission to explore Mercury and Venus. The television and ultraviolet experiments were trained on the comet Kohoutek while the spacecraft was en route to its destination. Using a near-ultraviolet filter, it produced photographs of the Venusian chevron clouds, and performed other atmospheric studies. Mariner 10 took 4,000 photos of Venus, which revealed a nearly round planet enveloped in smooth cloud layers. On 29 March and 21 September 1974, and 16 March 1975, Mariner 10 passed Mercury, and was able to map 40-45% of the planet. Its radiometer readings suggested Mercury has a nighttime temperatures of -297 degrees F (-183 degrees C) and maximum daytime temperatures of 368 F (187 C). The closest encounter with Mercury on the first pass was at 2047 UT on 29 March 1974 at a range of 436.5 miles (703 kilometers). Having looped around the Sun, Mariner 10 flew by Mercury again on 21 September 1974 at a range of 29,850 miles (48,069 kilometers), and photographed the sunlit side of the planet and the south polar region. The spacecraft used solar pressure on its solar panels and high-gain antenna for attitude control. A third and final encounter, the closest to Mercury, took place on 16 March 1975 at a range of 203 miles (327 kilometers). Contact with the spacecraft was terminated on 24 March 1975. Mariner 10 (also known as Mariner Venus Mercury 1973) was placed in a parking orbit after launch for approximately 25 minutes, then placed in orbit around the Sun en route to Venus. The protective cover of the sunward-facing electrostatic analyzers did not open fully after launch, and these intruments, part of the Scanning Electrostatic Analyzer and Electron Spectrometer experiment, could not be used. It was also discovered that the heaters for the television cameras had failed, so the cameras were left on to prevent low temperatures from damaging the optics. A trajectory correction maneuver was made 10 days after launch. Immediately following this manuever the star-tracker locked onto a bright flake of paint which had come off the spacecraft and lost lock on the guide star Canopus. An automated safety protocol recovered Canopus, but the problem of flaking paint recurred throughout the mission. The on-board computer also experienced unscheduled resets occasionally, which would neccesitate reconfiguring the clock sequence and subsystems. Periodic problems with the high-gain antenna also occurred during the cruise. In January 1974, Mariner 10 made ultraviolet observations of Comet Kohoutek and another mid-course correction was made on 21 January. The spacecraft passed Venus at 1701 UT on 5 February 1974 at a closest range of 5768 km, and returned the first close-up images of Venus. This also marked the first time a spacecraft used a gravity assist from one planet to help it reach another. Enroute to Mercury an attitude control anomaly occurred for the second time, using up much of the attitude control gas. Some new procedures were used from that point on to orient the spacecraft, including Sun-line maneuvers and the use of solar wind on the solar panels to orient the spacecraft. Mariner 10 crossed the orbit of Mercury at 2046 UT on 29 March 1974, at a distance of about 704 km from the surface. A second encounter with Mercury, when more photographs were taken, occurred on 21 September 1974, at an altitude of 48,069 km. Unfortunately, the lighted hemisphere was almost the same as the first encounter, so a large portion of the planet remained unimaged. A third and last Mercury encounter at an altitude of 327 km, with additional photography of about 300 frames and magnetic field measurements occurred on 16 March 1975. Engineering tests were continued until 24 March 1975, when the supply of attitude-control gas was depleted and the mission was terminated. Mariner 10 results showed a Hadley-type circulation existed in Venus' atmosphere and showed that Venus had at best a weak magnetic field, and the ionosphere interacted with the solar wind to form a bow shock. At Mercury, it was confirmed the planet had only a faint atmosphere of mostly helium, and an intensely cratered, dormant Moon-like surface was shown in the images. Mercury was shown to have a small magnetic field and a relatively large iron-rich core. P. Wild discovered asteroid #2303 Retsina. NASA published its "Strategy for Safely Returning the Space Shuttle to Flight Status" following the Challenger disaster. NASA launched STS 45 (Atlantis 11, 46th Shuttle mission) carrying the Atmospheric Laboratory for Applications and Science-1 (ATLAS-1) experiment package, and the first Belgian to go to space, Dirk Frimout. The launch of STS 45 was originally set for 23 March 1992, but delayed one day when higher than allowable concentrations of liquid hydrogen and liquid oxygen in the orbiter aft compartment were detected during pre-launch tanking operations. The leaks could not be reproduced during troubleshooting, leading engineers to believe that they resulted from the main propulsion system plumbing not being thermally conditioned to the supercold propellants. The launch was rescheduled for 24 March, when liftoff was delayed about 13 minutes due to low-level clouds at the Kennedy Space Center Shuttle runway. STS 45 marked the first flight of the Atmospheric Laboratory for Applications and Science-1 (ATLAS-1) experiment package, mounted on nondeployable Spacelab pallets in the orbiter cargo bay. The United States, France, Germany, Belgium, the United Kingdom, Switzerland, The Netherlands, and Japan provided 12 instruments designed to perform 14 investigations in four fields. Atmospheric science instruments/investigations were: Atmospheric Lyman-Alpha Emissions (ALAE); Atmospheric Trace Molecule Spectroscopy (ATMOS); Grille Spectrometer (GRILLE); Imaging Spectrometric Observatory (ISO); Millimeter-Wave Atmospheric Sounder (MAS). Solar Science experiments were: Active Cavity Radiometer Irradiance Monitor (ACRIM); Measurement of the Solar Constant (SOLCON); Solar Spectrum from 180 to 3,200 Nanometers (SOLSPEC); Solar Ultraviolet Spectral Irradiance Monitor (SUSIM). Space Plasma Physics experiments were: Atmospheric Emissions Photometric Imaging (AEPI); Space Experiments with Particle Accelerators (SEPAC). The sole ultraviolet astronomy investigation was the Far Ultraviolet Space Telescope (FAUST). On flight day six, mission managers determined enough onboard consumables remained to extend the flight one day to continue the science experiments. Co-manifested with ATLAS-1, and also located in cargo bay was: Shuttle Solar Backscatter Ultraviolet/A (SSBUV/A). A single Get Away Special (GAS) canister containing a crystal growth experiment was also flown. The middeck payloads were: Investigations into Polymer Membrane Processing (IPMP); Space Tissue Loss-01 (STL-01); Radiation Monitoring Equipment III (RME III); Visual Function Tester-2 (VFT-2); Cloud Logic to Optimize Use of Defense System (CLOUDS); and Shuttle Amateur Radio Experiment II (SAREX II). STS 45 ended 2 April 1992 when Atlantis landed on revolution 143 on Runway 33, Kennedy Space Center, Florida. Rollout distance: 9,227 feet (2,812 meters). Rollout time: 60 seconds. Launch weight: 233,650 pounds. Landing weight: 205,042 pounds. Orbit altitude: 160 nautical miles. Orbit inclination: 57 degrees. Mission duration: eight days, 22 hours, nine minutes, 28 seconds. Miles Traveled: 3.2 million. The flight crew for STS 45 was: Charles F. Bolden, Commander; Brian Duffy, Pilot; Kathyrn D. Sullivan, Payload Commander; David C. Leestma, Mission Specialist 2; C. Michael Foale, Mission Specialist 3; Byron K. Lichtenberg, Payload Specialist 1; Dirk D. Frimout, Payload Specialist 2. NASA's STS 76 (Atlantis) docked at the Russian Mir space station. STS 76 was originally set for a 21 March 1996 launch, pending resolution of an issue concerning wiper O-rings on the nozzle-to-case joints on both Redesigned Solid Rocket Motors (RSRMs) flown on the previous mission, STS-75. The first launch attempt set for 21 March was scrubbed prior to commencement of tanking operations on 20 March due to concerns about high winds. The launch reset for 22 March proceeded smoothly to an on-time liftoff. During ascent, a leak occurred in a hydraulic system powered by Auxiliary Power Unit (APU) number 3. The leak stopped after hydraulic system shutdown on-orbit. Mission managers concluded the system would remain stable, and proceeded with plans for a full-duration mission. The third linkup between the US Space Shuttle and the Russian Space Station Mir was highlighted by the transfer of veteran astronaut Shannon Lucid to Mir to become the first American woman to live on the station. Her approximately four and a half month stay also eclipsed the long duration US spaceflight record set by the first American to live on Mir, Norm Thagard. Lucid was succeeded by astronaut John Blaha during STS-79 in August. Her stay give her the distinction of membership in four different flight crews in one mission -- two US, and two Russian -- and her stay on Mir kicked off a continuous US presence in space for the next two years. The STS 76 payload bay configuration included the Orbiter Docking System in the forward area, and the SPACEHAB single module toward the aft. STS-76 marked the first flight of the SPACEHAB pressurized module to support Shuttle-Mir dockings; the single module primarily served as a stowage area for the large supply of equipment slated for transfer to the space station, but also carried the European Space Agency's Biorack experiment rack for on-orbit research. Atlantis docked with Mir on 24 March 1996. Hatches opened a little less than two hours later. Awaiting Atlantis' arrival were Mir 21 Commander Yuri Onufrienko and Flight Engineer Yuri Usachev, launched to Mir on 21 February. In July, they were joined by Mir 22 Commander Gennady Manakov, Flight Engineer Pavel Vinogradov and French Space Agency cosmonaut researcher Claudie Andre-Deshays. After a two week stay, Andre-Deshays returned to Earth with Onufrienko and Usachev while Manakov and Vinogradov remained on board with Lucid. During the five days of docked operations, about 1,500 pounds (680 kilograms) of water and two tons of scientific equipment, logistical material and resupply items were transferred to Mir; and experiment samples and miscellaneous equipment were brought over to the orbiter. In Biorack, 11 separate scientific investigations were conducted. Study topics included the effect of microgravity and cosmic radiation on plants, tissues, cells, bacteria and insects, and the effects of microgravity on bone loss. Also transferred to the station were the Mir Glovebox Stowage (MGBX) equipment to replenish the glovebox already on the station; Queen's University Experiment in Liquid Diffusion (QUELD) flown in an orbiter middeck locker; and the High Temperature Liquid Phase Sintering (LPS) experiment. On flight day six, Godwin and Clifford conducted the first US extravehicular activity (EVA) around the two mated spacecraft. During the six hour, two minute, 28 second EVA, they attached four Mir Environmental Effects Payload (MEEP) experiments to the station's Docking Module. The experiments were designed to characterize the environment around Mir over an 18-month period. The two spacewalkers wore Simplified Aid For EVA Rescue (SAFER) propulsive devices first flight tested during STS-64. Other payloads flown on STS 76 were: Shuttle Amateur Radio Experiment (SAREX); KidSat, a project that gives middle school students the opportunity to participate in space exploration; and Trapped Ions in Space (TRIS), a Naval Research Laboratory experiment flown in a Get Away Special (GAS) canister in the cargo bay. STS 76 ended 31 March 1996 when Atlantis landed on revolution 145 on Runway 22, Edwards Air Force Base, California. Rollout distance: 8,357 feet (2,547 meters). Rollout time: 55 seconds. Orbit altitude: 160 nautical miles. Orbit inclination: 56.1 degrees. Mission duration: nine days, five hours, 15 minutes, 53 seconds. Miles Traveled: 3.8 million (estimate). Mission managers re-scheduled the landing from 31 March to 30 March in anticipation of rain and clouds at the KSC landing site, but landing attempts at KSC on 30 March and 31 March were waved off due to weather, before the orbiter was finally diverted to California. A more conservative weather criteria was employed for the landing due to the leak in the APU number 3 hydraulic system, and special measures were taken during re-entry to minimize use of that particular APU. Following waveoff on 30 March, a payload bay door reopening process was interrupted when the release indicators for payload bay door centerline latches 9 through 12 on both sides failed to indicate release, suggesting the latches had not operated properly. The astronauts ventured into the SPACEHAB module in the aft payload bay to visually inspect the latches, which appeared to have opened as intended. The crew used manual mode to complete opening of the doors without further incident, and the glitch was attributed to faulty microswitches. Also, during prelanding preparations, three of the 38 Reaction Control System (RCS) thrusters failed, but backup thrusters were available to perform the same functions. This was not considered a night landing because it occurred only 11 minutes before sunrise; flight rules define night launch/landing as one occurring no earlier than 15 minutes after sunset and no later than 15 minutes before sunrise. The flight crew for STS 76 was: Kevin P. Chilton, Commander; Richard A. Searfoss, Pilot; Shannon W. Lucid, Mission Specialist (remained on MIR); Linda M. Godwin, Mission Specialist; Michael R. Clifford, Mission Specialist; Ronald M. Sega, Mission Specialist. Asteroid 1989FC (4581 Asclepius) will make its next closest approach to Earth (0.012 AU, 1,800,000 km; 1,100,000 mi).